The bullet journal system has really been blowing up in the past year or so. Just like with any other popular thing, this means the introduction of blogs about said topic - in this case, bullet journals! 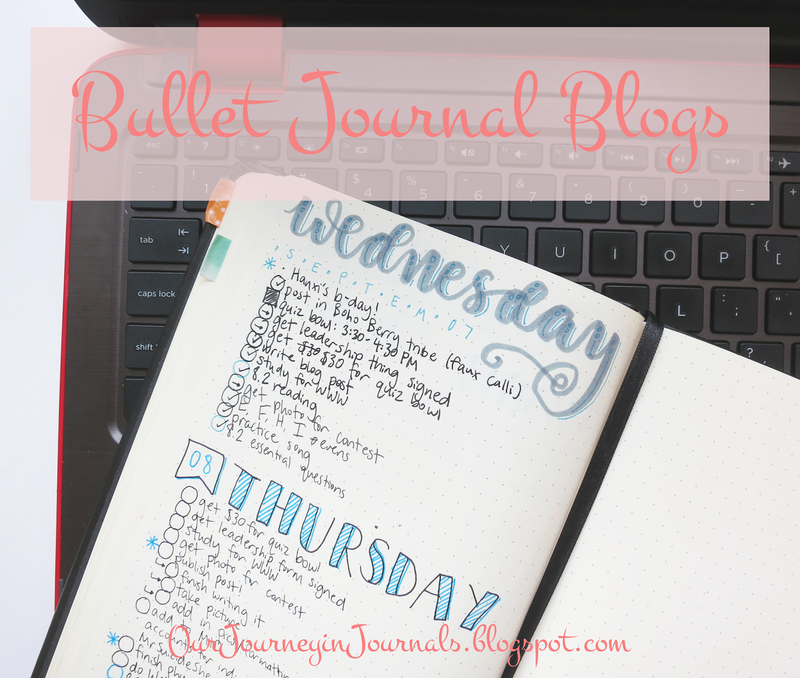 Thus, I've decided to compile this list of blogs about bullet journals. Keep on reading to see them! Also, if you have any suggestions for anymore blogs that I should include, please, please, please leave a comment down below! But yeah, now that I've gotten that stuff out of the way, here are some bullet journal blogs! Is your #bulletjournal ready for #september ? The blog now updated with posts from @bujo.auslife @evieandsarah and @bujopros check it out! This is the blog made by Ryder Carroll, the original creator of the bujo system itself. Ryder Carroll himself doesn't post very often, but at the beginning of the month, several posts written by influential members in the bullet journal community are published. Of course, as to be expected, every single post is about bujos; the topics range from show-and-tells to bullet journal hacks. I think 99% of the bullet journal community knows about Kara Benz of Boho Berry; she's a fabulous lady with a fabulous blog (and Etsy shop). She also has a YouTube channel that has both stand-alone and companion videos that go along with some of her posts. Whether you're a complete bujo newbie or a seasoned user, I think you would enjoy her posts. She's also one of the hosts of the #RockYourHandwriting challenge and #PlanWithMeChallenge. Jessica, the author behind PP&P, is also one of the hosts of the two previously mentioned challenges. She is a traveler's notebook user and a college professor, if that's something you're interested in. Her blog is a good mix of both bullet journal and calligraphy/hand-lettering posts. She also has a YouTube channel, which again, features both of these topics. Again, Kim of Tiny Ray of Sunshine is one of the hosts of #RockYourHandwriting and the #PlanWithMeChallenge. She is a minimalist bullet journaler, and her ingeniously-created spreads go to show that you don't need to use a plethora of colors and adornments to make beautiful-looking pages. She unfortunately hasn't been posting much content on her blog this summer, but she does regularly update her Instagram. Dee is a new mom, so she hasn't had much time to post lately, though her blog is overwhelmingly primarily about bullet journals and planning. She also has several posts about handwriting, and she's the fourth and final host of the #RockYourHandwriting challenge. Her handwriting is absolutely gorgeous. Ohayo Bento was created by Heather, who is also a new mom. Her bujo spreads and photos are always so sharp and well-done. She's also been transitioning into a disc-bound system for long-term collections, if that's something that you want to learn about. She also has some posts about food and bentos, as you can probably tell from the name. Christina is known for her awesome doodles in color pencil; she's a co-host of the Doodle With Us challenge on Instagram. Though bullet journaling is the main topic of her blog, she also sometimes writes about inspiration and blogging tips. Kacheri, the author of PTL, is a home-schooling mom and a student herself, so her planning and blog reflect that. She also enjoys using lots of color and various artsy decorations, and she hosts the #PTLDoodles challenge. She uses a traveler's notebook for bullet journaling. Bree has a very distinct style of bullet journaling; it's very clean with beautiful handwriting and bright accents of color. Her spreads are quite minimal, and they're very pretty. She also has an Etsy shop for planner stickers. Camilla, who first started on Instagram and later spread her reach to a blog, is a semi-popular bullet journalist in the community. Again, her spreads are somewhat minimal with pops of clean color. I'm a big fan of her bright pictures. Megan of Page Flutter has so many really unique posts about bujoing that you won't really find anywhere else - she has lots of original "hack" or tip posts. Along with being a blogger, Megan is also a writer; she hosts the 6 word story challenge on Instagram. I don't know much about Sandra, the author of this blog, but just looking at her pictures just makes me happy; her spreads and pictures are all very nice and bright. Sandra herself is an artist, so her spreads are all very artistic, and she incorporates lots of drawings on the pages of her bujo. Her Etsy shop, which will contain planner-related items, is coming soon. As you can probably tell from the title of the blog, Zoot posts exclusively about bullet journals. She's got lots of experience under her belt, as she's been utilizing the system for more than three years and has filled up 11 bujos (as of the time I'm writing this post). She also has a couple of bullet journal posts on her personal blog. Hey Pros - Time to organize my areas of influence a little better. As I plan my week, I have realized that my calendar of appointments are not as important as my work tasks and getting things done in the areas of business development, marketing and management (SLT). I have also expanded my tracker to stay focused on matters of health, productivity and creativity. Keeping it monochromatic this week. Aside from my messy handwriting, what do you think, Pros? Heidi's blog is relatively new (it's only a couple of months old), but it's already been gaining some serious traction! Her posts are quite helpful and well-written, and her spreads are all beautifully-made. Go show her some love! Show Me Your Planner (now moved to Zen of Planning) started out as an Instagram account that features pictures of other planners, mostly bullet journals, on Instagram. Now, it has expanded to a Pinterest account and a blog. The blog has different sorts of posts about bullet journaling, mostly including inspiration and different ideas for bujos. This Italian site has a mixture of original posts, which I don't really care about and have not read, and links to other people's posts, which is the part that I do care about. So, if you want to learn about the different components of a bullet journal in Italian, or if you want to find some good posts made by other "big" people, then you might want to look through this site. Those were 18 blogs about bullet journals and a very basic overview of them. I hope you were able to discover a new blog within this post! Comment down below either your favorite bujo blog or a blog that I missed! This is a very nice post, I liked it very much. Whatever you have shared here is very nice and I will definitely going to follow your insta pages soon. You can check out here too. bulletjournal.com is an amazing blog for starters. I simply love tiny ray of sunshine as well as bohoberry too.